Sarah was born into adoption at a private hospital in Orange County and was molested by her pre-school teacher at the age of three. Eighteen years of psychological and sexual abuse followed Sarah into adulthood, where the lingering devastation of her childhood spiralled into uncontrollable drug addiction and mental illness. Sarah eventually surrendered to the streets, becoming homeless aged 19. She was living out of friends’ cars and public bathrooms until Pathways to Independence found her and gave her food, healthcare, education and a place to live. She is now five years sober, and is close to graduating from her sociology program at Cal-State Long Beach with a 4.0. Two years ago she was diagnosed with throat cancer, and after a determined battle against the disease, she is now in full remission. 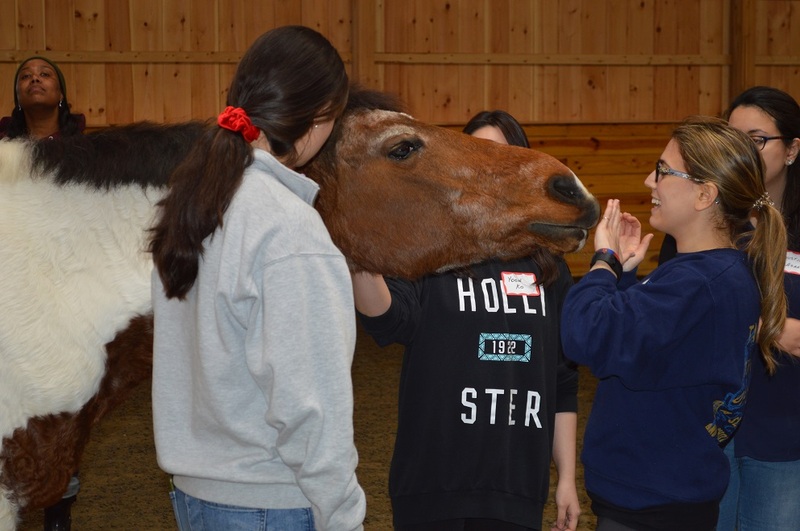 To work through ongoing problems attached to her self-esteem, confidence and trust in other people, Sarah enrolled in an equine-assisted therapy program. Sarah’s gaze searched the eyes of each horse. She established an immediate connection with Madonna, a 20-year-old mare trained by champion cowgirl Carol Rose in Texas. Caddes guided Sarah into a sensory exercise that stretched her comfort zone by feeling her way around Madonna’s body with her eyes closed. It is common for people to feel intimidated by the sheer size and power of horses –weighing up to 2,000lb, horses can become metaphors for dealing with intimidating life circumstances. As Sarah developed more confidence, she assumed more control within the herd by leading Madonna from behind without the use of ropes or a whip – an instinctual method used by horses to push and lead each other. 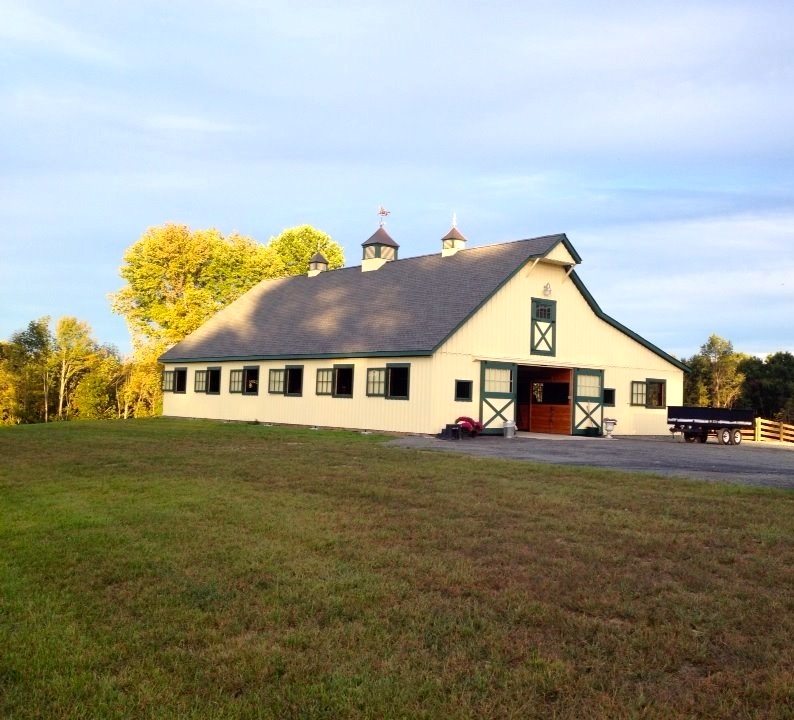 “I was a little skeptical at first and I found the horses to be very intimidating. I didn’t know what was going to happen. I had no expectations … I made eye contact with Madonna and I felt immediately connected to her. 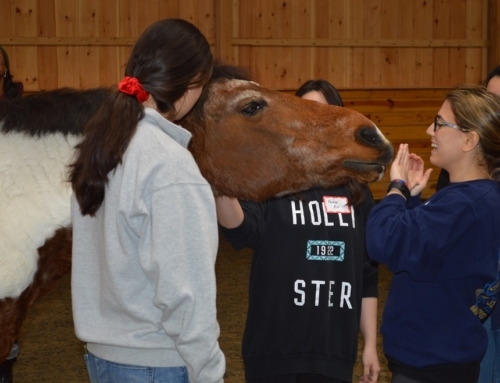 The sensory exercise was really cool, it was scary, but it bridged the gap between me and the horse,” Sarah explained. Caddes works within a physiological therapy model, always watching eye dilation, heart rate, body language and gestures. 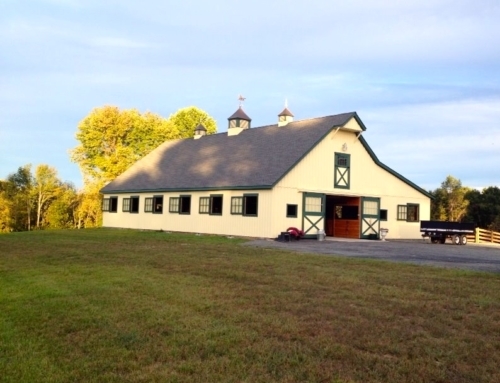 Her role was to safely guide Sarah through a series of ground-based activities that kept both her and the horse within a therapeutic window of arousal – “If they get too high the client will dissociate and the horse will panic, if they get too low there can be a feeling of depression or disengagement,” she explained. 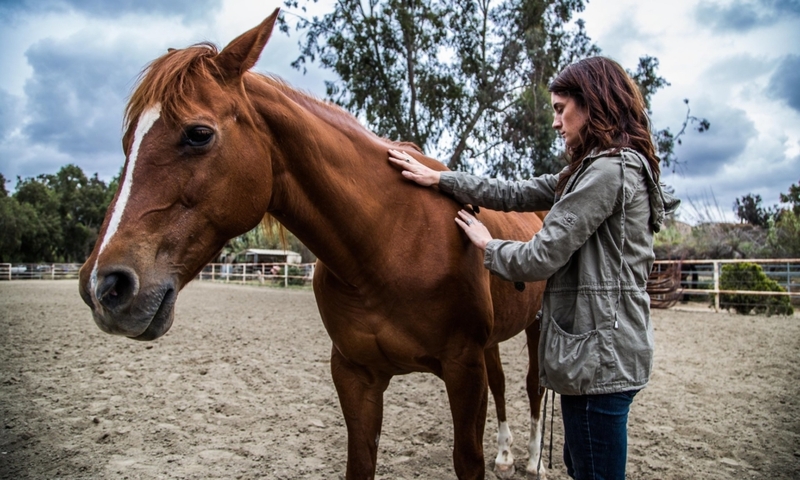 At the beginning of the second therapy session, Sarah found the horses far less intimidating. Caddes directed Sarah to select a prop and make it symbolic of an aspect of her life. Sarah unravelled a small colorful parachute that signified her confidence in school. Sarah then cast the parachute to the wind and laid it down in the middle of the arena, but Madonna wouldn’t budge. 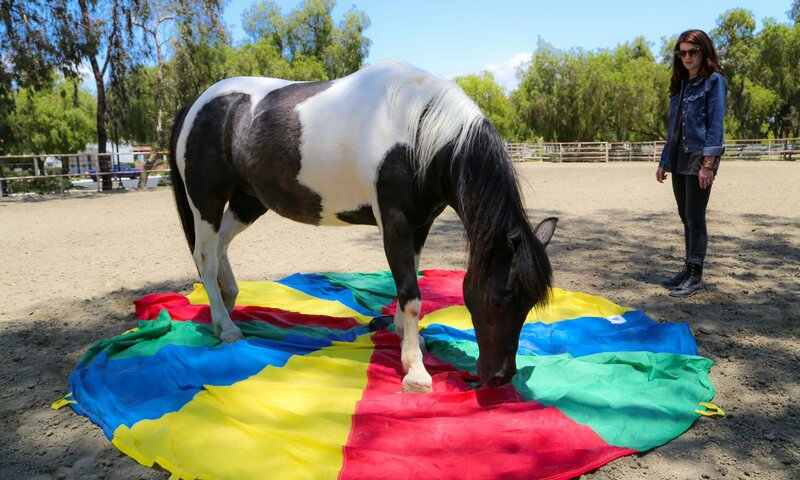 Instead, a nine-year-old pinto mix named Chips wandered over and began investigating the parachute. With a flick of the head and a stomp of her hoof, the wild pony unexpectedly bolted to the other end of the arena in a nostril-flared panic, leaving Sarah marooned on her fabric island in the middle of the wide arena. Sarah mustered the courage to reapproach Chips, and softly stroked the pony’s mane. She was struck by an intense surge of emotion, and tears began to stream down the side of her face. Chips gently nuzzled into her, allowing Sarah to be fully present with the horse and revisit her trauma without been enveloped by its vortex. On her third and last session, Sarah led Chips and Madonna out of the stables and into the arena, where she divided the therapeutic space into three sections that represented her past, present and future. The moment was peaceful, and Sarah drew in a deep breath, relaxed her shoulders, and took a confident stride forward, compelling Madonna into a companion walk, side by side, shoulder to shoulder. 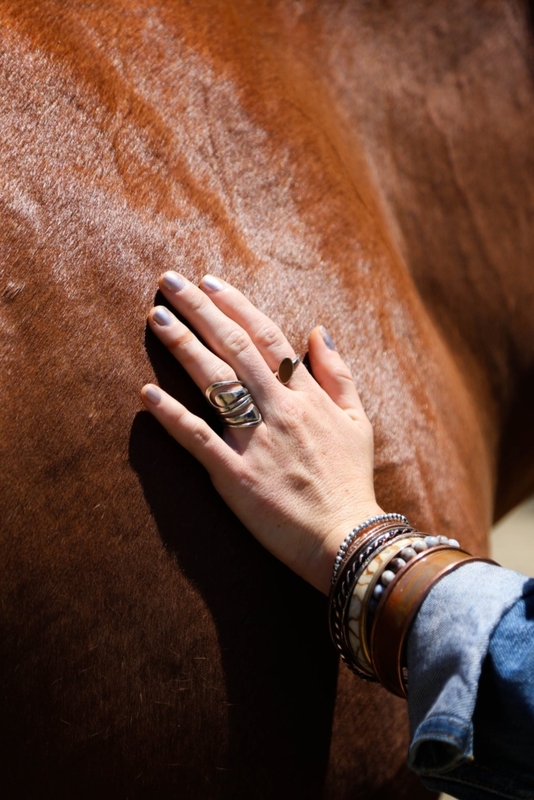 She explained that “walking through her childhood” with the horses forced her to put her pain in the past, and helped her identify the person she hopes to become. Sarah also noted a considerable improvement in her communication skills and confidence as a direct result of this program. 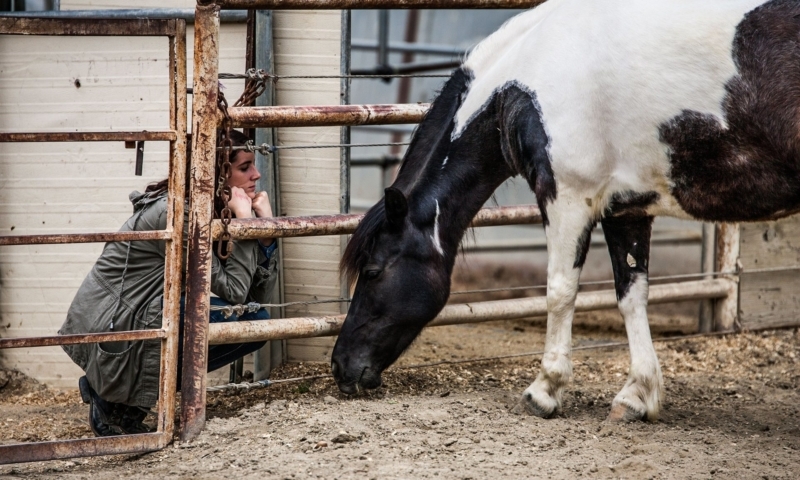 Reflecting on the experience, Sarah is in awe of the horses, unable to articulate how healing the program was. “Words are so limiting sometimes,” she said with a smile.